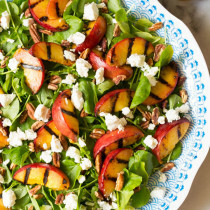 Today’s Grilled Peaches and Watercress Salad is a celebration of summer produce at its finest. Our “Summer of Salads” continues today with a salad I just can’t get enough of. Sweet southern peaches kissed by the sun are an ingredient I wait for all year long. Every summer is a gamble when it comes to peaches. Some years we are blessed with irresistibly juicy peaches bursting with vibrant color and tantalizing flavor. Other years we wait all season, only to find that the peach crop is mealy and bland. Fortunately, this year the peaches are in rare form! Every single peach I’ve bitten into so far has been a flashback to the best of summer memories. Sweet, fragrant, and nostalgic. Of course we buy them up by the bushel and use these primo peaches in every form and fashion that comes to mind. 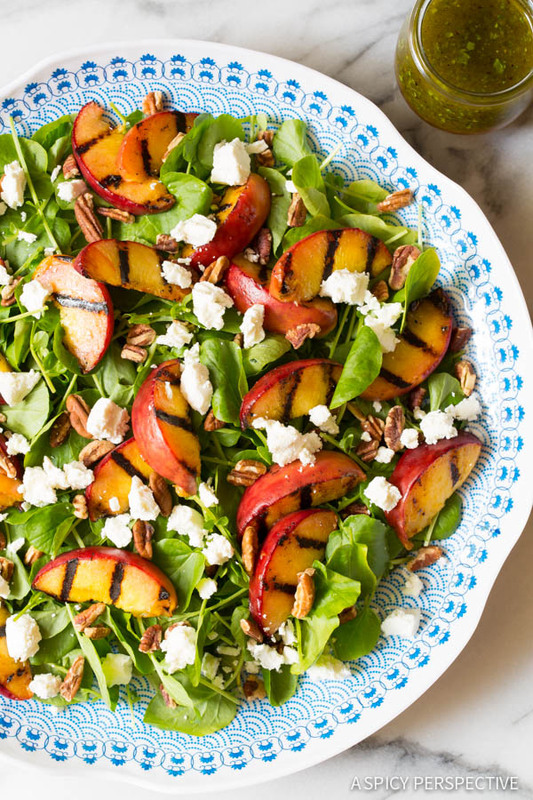 Yet, fresh peaches ever so slightly charred on the grill, then piled on a fresh green salad is one of my favorite ways to enjoy them! With summer salads, focusing on fresh simple flavors is always the way to go. 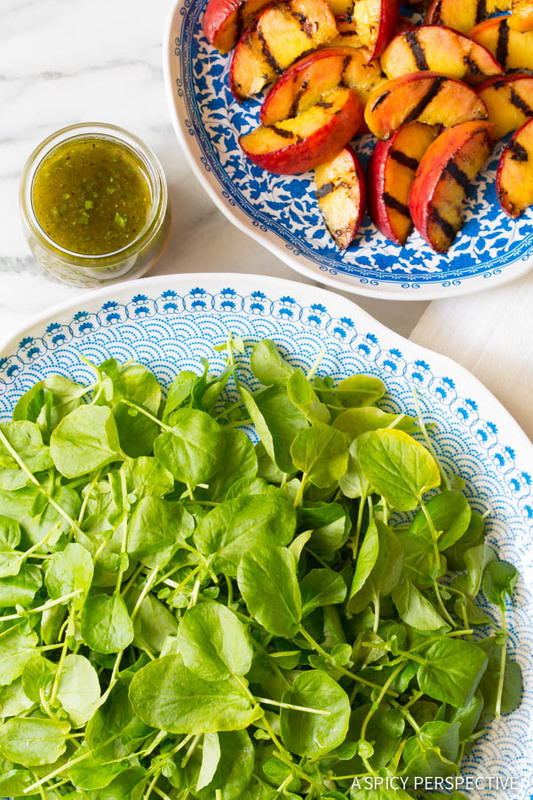 Today’s Grilled Peaches and Watercress Salad with Basil Vinaigrette requires only four ingredients for the salad itself… plus a few more for the dressing. 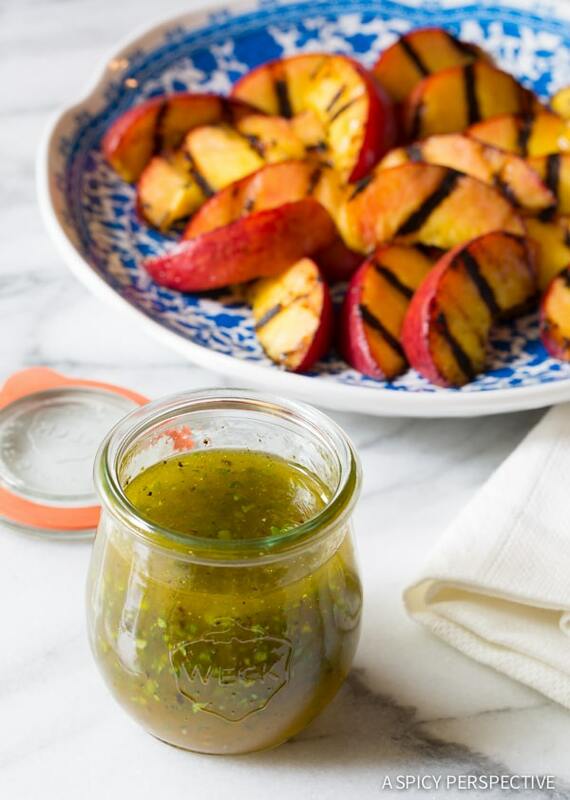 Grilling the peaches elevates their sweetness with a light smoky note. I arranged the peaches on a bed of peppery flavored watercress. Then sprinkles toasted southern pecans and cool creamy goat cheese over the top. The only thing that could perfect such a wondrously simple salad is a light herby vinaigrette… and maybe a pretty plate. I made this Grilled Peaches and Watercress Salad on a Q Squared NYC Heritage Platter that is both beautiful and practical. Q Squared dishes are thoughtfully made out of crack-resistant melamine and priced affordably to make all your summer salads the jewel of the table! 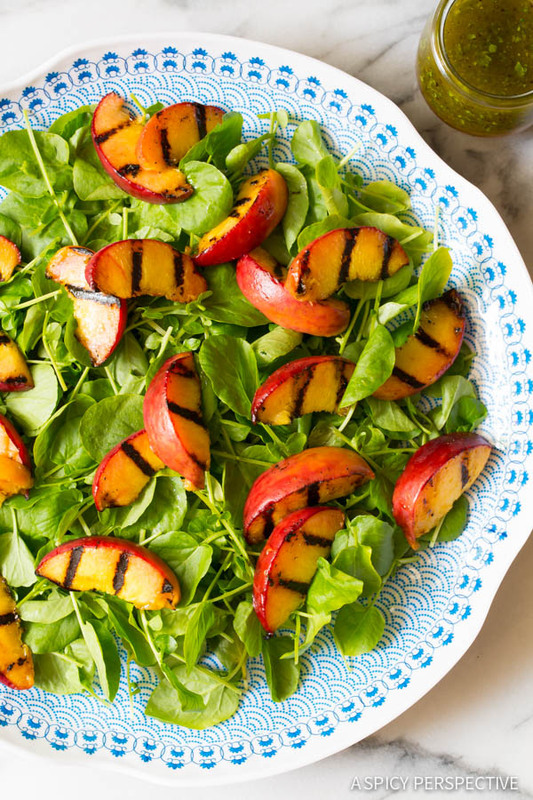 Our Grilled Peaches and Watercress Salad with Basil Vinaigrette will be on our table over and over this peach season. We think it should be on yours as well. 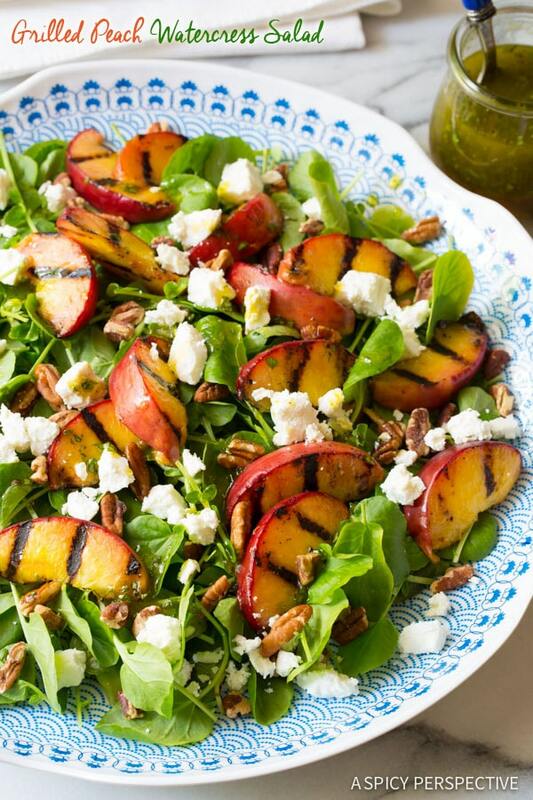 Amazing Grilled Peaches and Watercress Salad loaded with toasted pecan, goat cheese, and fresh basil vinaigrette. 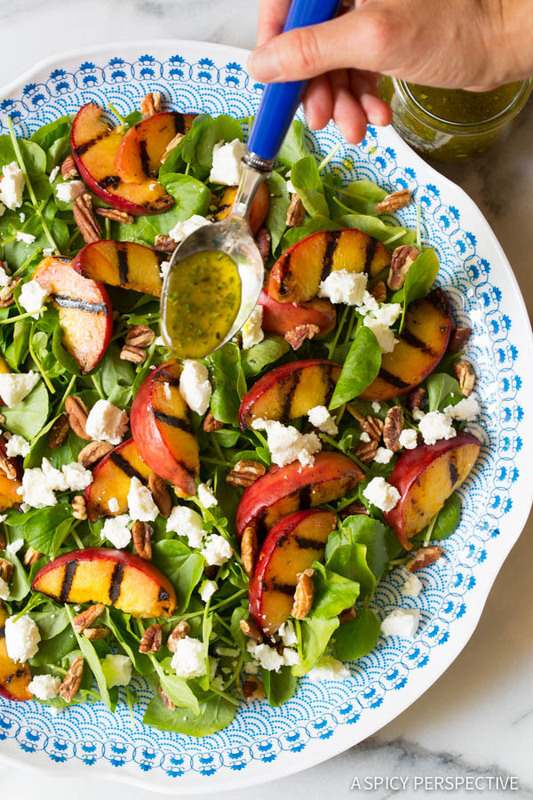 A Grilled Peach Salad everyone will love! Preheat the grill to high heat. Cut the peaches into wedges, then drizzle with olive oil and sprinkle with salt. Once the grill is hot, grill the peaches for 1 minute per side, then remove and cool. Mix 1/3 cup olive oil, balsamic vinegar, honey, and basil to a small bowl. Whisk well, then salt and pepper to taste. Trim the watercress and pile on a large platter. 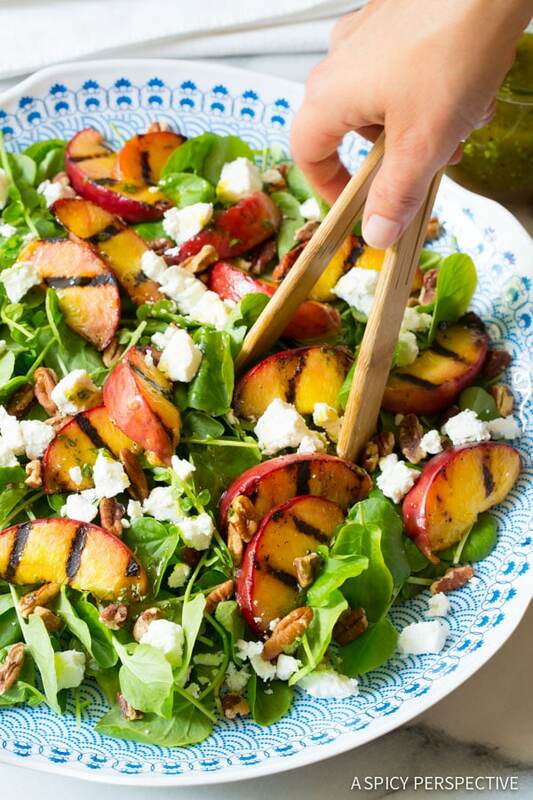 Arrange the grilled peaches, toasted pecans, crumbled chevre on top. Drizzle with the basil vinaigrette and serve immediately.